I don’t know why, but Mikey seems to have unfairly usurped my title of “man of the people.” Maybe it’s because I use words like usurp when I write. Who knows? 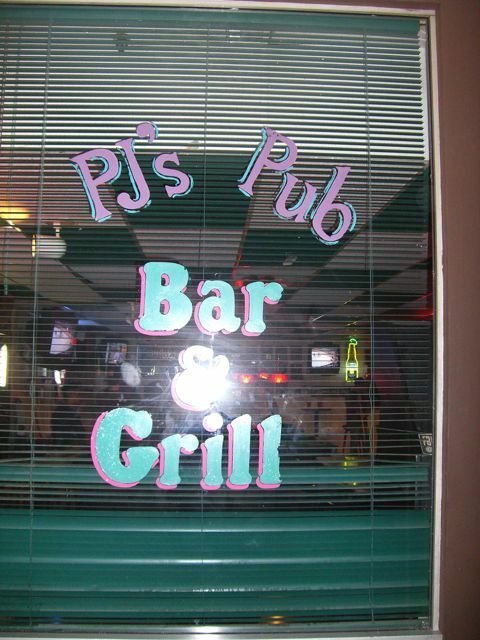 In an effort to get my title back, I’ve decided to bring you a post on the only “dive bar” in Thousand Oaks: PJ’s Pub. PJ’s Pub – At Moorpark Rd and Avenida de los Arboles in the Trader Joe’s shopping center, Thousand Oaks. Say what you want about PJ’s. No, really, say what you want about the place, they don’t give a damn. This is a bar that makes no apologies for what they are: a place to play some pool, get drunk and eat greasy bar food. In my opinion that’s what makes them unique to Thousand Oaks. PJ’s is a little bit of Bakersfield, thrown down in the middle of the Conejo Valley. It’s true, I normally prefer the trappings of the nice restaurants. But sometimes in order to get the best food you gotta get your hands a little dirty. This place is light on the decor, with 4 bar sized pool tables, a few dart boards and a little bar that always seems to be able to accommodate one more. It’s a small place, tucked away in the corner, that you probably would have passed by without a second glance. But it is here that I found a diamond in the rough: The Mega Burger. For nine bucks and change you get this monstrosity. 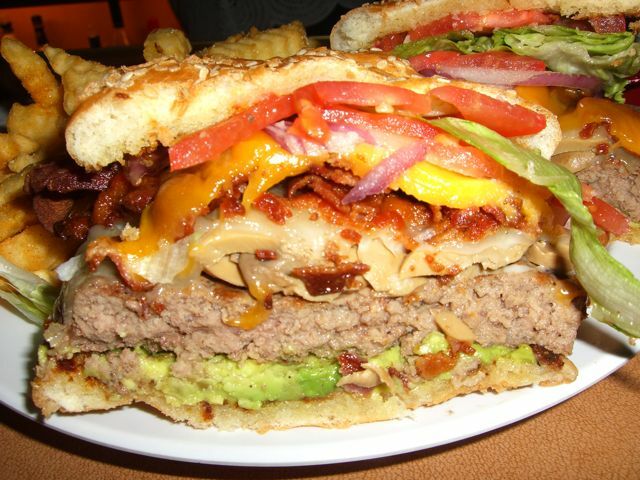 Included in the ingredients are avocado, mushrooms, swiss and cheddar cheese and a big serving of bacon. Fully cooked, the 1/2 pound patty is just that, a 1/2 pound. It comes with a side of fries that was probably at one time at least two full potatoes. The fries are crispy and flavored with a generous dusting of lawry’s seasoning salt. The burger was so big that I had to cut it in half to eat it. When I had finished cutting, the guy sitting next to me at the bar suggested that I take a picture of the Mega’s insides. Of course, I obliged. It’s not hard to find great things to say about this burger. The beef was juicy and substantial. Putting the avocado at the bottom was a stroke of genius that kept it in every bite. The bacon was thick and crispy. The amount of cheese was obscene and the mushrooms were meaty. Even the lettuce, tomato and onion were fresh and crisp. My only complaint is a small one. The bun just couldn’t keep up with the burger. I was struggling to pick the thing up, even after cutting it in half. Once all of the juices soaked in, it became all but impossible. In the grand scheme of things it’s not a big problem, but I definitely think that the Mega Burger deserves something other than your standard sesame seed job. Maybe the staff will read this post and petition the owner for a better option. What kind of bun do you think would be best for this monster. I know nine bucks is a lot to pay for a burger, but let me show you the value. I managed to finish the mega somehow, but I only got to eat about three of the fries. Had I paced myself properly, I would have had 2 full meals worth of food. I almost felt bad letting all those fries go to waste, but once I had started in on the Mega, it was as if everything else melted away. I had the blinders on and I wasn’t stopping until the race had been won. The regular burgers at this place are pretty tasty too and the steak sandwich that I saw had to have been at least ten ounces of meaty goodness. They also do a bunch of bar staples like wings, fried mozzarella and fried shrimp. If eating isn’t your thing, they’ve got plenty of booze to drink. They are a bar, after all. They’ve got around 7 beers on tap, including stella, guinness and sierra nevada. Plus they’ve also got a large selection of bottled brews. I actually went for the rum on my visit (after I had defeated the Mega). I saw that they had a particular brand of rum that I had only read about in the pages of Maxim. 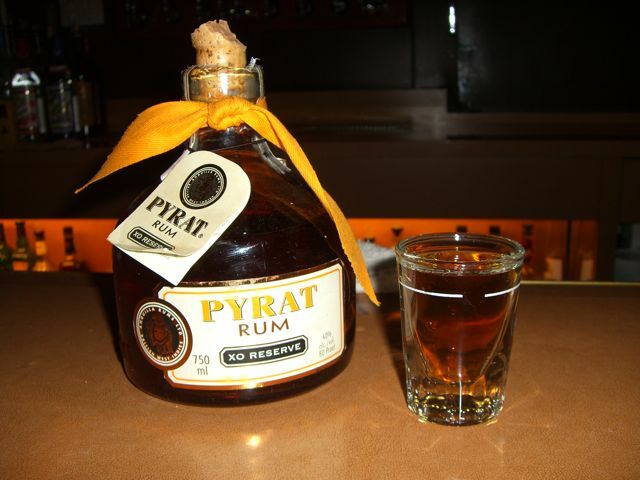 That rum is called Pyrat and I was the first person who had ever ordered it at PJ’s. I must say that it was pretty nice. It had a slightly sweet flavor, but not enough to give me the “rum shake” that sometimes happens with the cheaper stuff. You know what I’m talking about… that involuntary shudder that can overtake you when taking those shots to the dome. Anyway, since I’m kind of a teetotaler these days, I took the absence of that reflex to mean that this was some good stuff. Just don’t mix it with coke or they’ll throw you outta the bar. I really hope that a few more of our readers, who may have been too frightened to try this place, give PJ’s a shot. Their burgers are delicious and a great value in my book. The people warm up to you quickly and are, at a minimum, an interesting lot. You can go shoot pool, throw darts, drink like a man and cuss like a sailor. And always remember, you don’t have to tell your snobby friends where you went. What happens at PJ’s, stays at PJ’s. 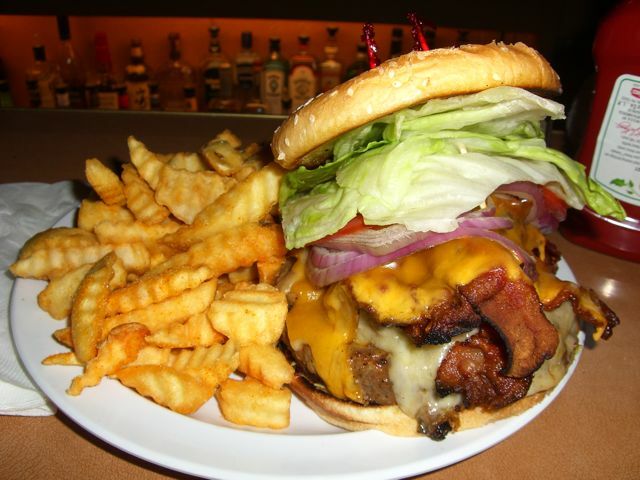 so…does this burger compete with The Counter? The Applepan? and while I’m yappin at ya….. I love a good burger..but I’m a bit of a purist…..(which, I understand completely negates the purpose of ” man food burgers”) so… why avocado on a burger? I want to taste the excellence of the 80/20 or the 70/30 on my buns…. you heard me…….. I dont’ need it dredged in chili or fried pickles or cheeze whiz or hot sauce. Good beef….good grill…good cheese….good seasoning……. the rest better enhance my meat experience or 86 it! SO says ayyye……. now pass the rum……. I love their burgers there! I grew up on them since my bakery was right next door! I used to be a PJ’s regular – their fried, greasy food is excellent, even though they don’t have a 4 star chef back there or anything.